Introductions to the Old English poem called Beowulf often begin with something of the sort: 'Beowulf is written in West Saxon and recorded only in the Cotton Vitellius A. xv manuscript…' One may wonder why such a work would be introduced in this rather dry and relatively uninformative manner. Unfortunately, very little can be said definitively as regards the poem's authorship, date or location of composition, purpose, theme, &c.
On definitive ground, we can describe Beowulf as the longest surviving poem in Old English and one of the earliest European epics written in the vernacular (rather than in Latin). Written in unrhymed, four-beat alliterative metre of Old English poetry, it tells of the exploits of the hero Beowulf. The first part of the tale narrates Beowulf's youthful adventures in Denmark battling the monstrous creature Grendel on behalf of the King Hrothgar of the Danes, and the second part narrates his later life, including his fight with a fire-dragon, during his reign as the King of Geatland (traditionally located somewhere in southern Sweden or one of the Baltic island on the east coast of Sweden). 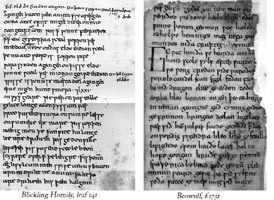 We may say that Beowulf was composed somewhere in England between about 521 AD (the approximate date of the death of the historical model for the character Hygelac) and 1026 AD (more or less the latest possible date of the manuscript itself). We do not know for sure where in England the poem was composed. Nor do we know if the poem was composed by a single author, or whether it is the result of the merging together of ballads by different authors, nor whether the poem was significantly altered subsequent to its first written form. The poem's purpose is also unclear - arguments have been made for a naturalistic mythic allegory, a Christian allegory, a criticism of heroic culture, a mourning for the loss of heroic culture, a Germanic 'Old Testament', an allegory concerning contemporary politics in one or other of the Saxon kingdoms - just to mention a few. The title Beowulf itself is an editorial convenience -- the manuscript copy of the poem is untitled. We also know almost nothing about Beowulf's place in English literature in the Anglo-Saxon period - we do not know what popularity, if any, the poem enjoyed. Certainly, awareness of the poem seems to have disappeared entirely by the early Middle English period, and the poem does not re-enter the canon of English literature until the late 18th and early 19th centuries - which places Beowulf in an odd ancient/modern position within the history of English literature. Let it suffice that very little can be said with certainty on almost any aspect of the poem. This introduction is an attempt to provide an overview of what is known about the work and also to present some of the claims which have been made on the less certain aspects. I shall endeavour to provide a fair account of some of the major theories, though I reserve the editorial prerogative to suggest what seems most plausible to me. a. Provenance of Beowulf ms. 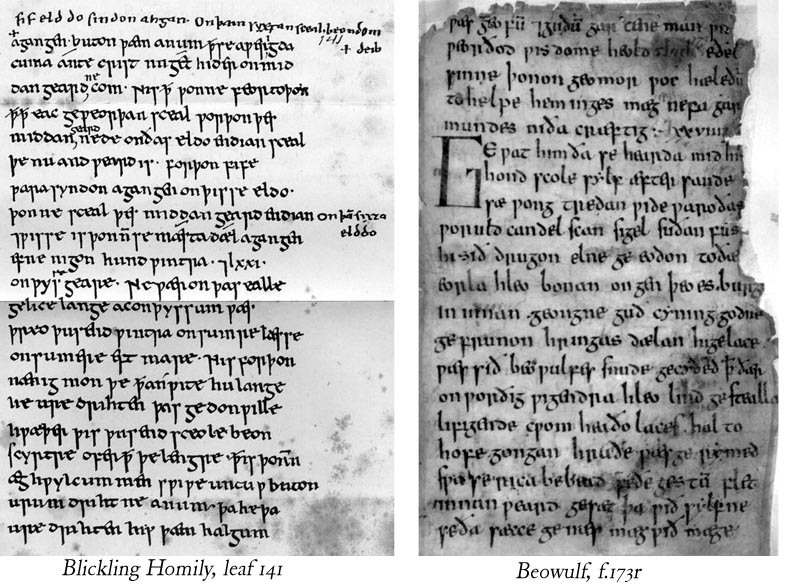 The Nowell Codex is also a composite book; and Kevin Kiernan offers convincing evidence that Beowulf itself originated as a separate codex (see below). 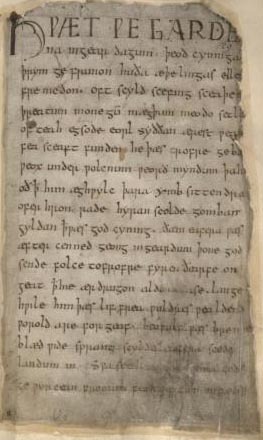 The Beowulf MS was written down circa 1000CE by two scribes in late West Saxon (the literary and posh dialect of the period). 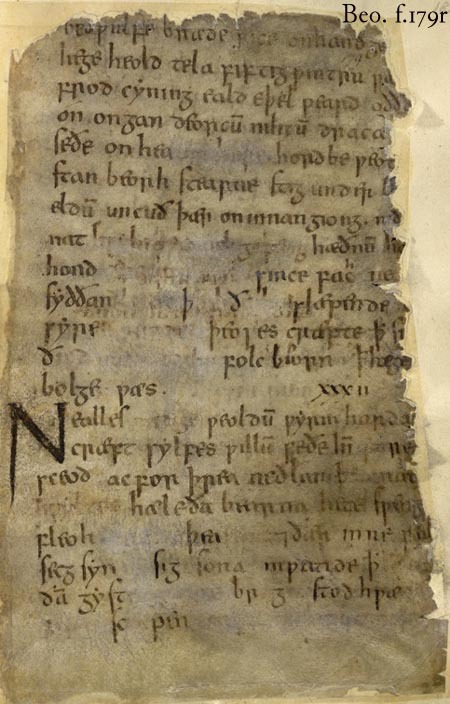 The first scribe, who writes in an Anglo-Saxon rounded insular minuscule hand with some carolignian features, copied the first three prose pieces of the Nowell Codex and a little over the first 85 pages of Beowulf (up to the word moste on line 1942 in this edition, on folio 172v). The second scribe, who writes a more conservative Anglo-Saxon square minuscule hand, copied the remainder of Beowulf (roughly 1238 lines) and the poem Judith which follows. Both scribes proof-read their writing, and the second scribe also proof-read the writing of the first scribe (see Kiernan for further details), as well as possibly making some later alterations to Beowulf (see II. below). There are currently 116 leaves in the Nowell Codex, Beowulf filling 70 of them. The beginning of St. Christopher was already lost when Nowell put his name on the first leaf (and probably the bulk of Judith as well). Nowell probably preserved the manuscript after King Henry VIII's dissolution of the monasteries after the break with Rome. Its history prior to coming into Nowell's possession remains a blank. During the reign of Queen Elizabeth I, the Nowell Codex passed into the library of Sir Robert Cotton [1571-1631], an antiquarian; whence its British Library designation, for Cotton catalogued his books according to busts of the Roman emperors that surmounted each of his bookcases, and in the case of the codex in question, it was presided over by Vitellius. The Cotton collection was presented to the British people in 1700 by Sir John Cotton, grandson of Sir Robert. A committee of the House of Commons became trustees of the bequest and appointed Humfrey Wanley as one of the members of a commission to report on the state of the library. Wanley reported that the location of the library, in the Cotton House, was unfit and eventually, in 1722, the collection was moved to Essex House, Strand and there it remained for seven years. Though an Act of Parliament (6 Anne, c. 30) had endorsed the construction of a new building to house the collection in 1706, the Cotton Library still had no permanent home. So in 1729, after Essex House was deemed unfit, it was moved to another interim residence: the Ashburnham House in Westminster. The ill-omened name did not fail to disappoint, and in October 1731, the house caught fire. Much of the library was damaged and some volumes completely destroyed--damage resulted not only from the flames themselves, but also from the water used to extinguish the fire; the Beowulf MS was presumably saved by being thrown from the window, though it is badly burnt along its outer edges (see Syd Allan's Ashburnham House Fire page and Andrew Prescott's online article '"Their Present Miserable State of Cremation": the Restoration of the Cotton Library' for more details on the fire). The collection finally made its way in 1757 into the care of the British Museum, where it was finally provided a much-needed rebinding in August 1845, as well as having its leaves inlaid within heavy sheets of paper--the latter of which, for the most part, halted the loss of letters and words from the crumbling edges of the MS, which had previously suffered this sort of damage continually from the late 1700s until 1845. It is unclear exactly when Beowulf began to be studied in post-Saxon times. Nowell and Cotton may or may not have paid it any attention. The first modern reference to the poem is a brief description by Humfrey Wanley (see above) who mistakenly described it as a story about Beowulf 'the Dane' who feuded with Swedish princes. This inaccurate description drew the attention of the Icelandic scholar Grímur Jónsson Thorkelin, who worked in Denmark as an archivist, eventually becoming the Royal Danish Archivist. In 1786 Thorkelin went to England to research Danish heroes in British libraries; coming across Wanley's description, he hired a professional scribe to copy the manuscript (the document now known as Thorkelin A) and later himself made a copy (Thorkelin B). These transciptions are invaluable in that they preserve almost 2000 letters which are now lost from the edges of the scorched vellum. The poem was not printed in its entirety until Thorkelin's edition (with facing Latin translation) appeared in 1815; the first complete vernacular translation (in Danish) of Nicholas Grundtvig appeared in 1820; and not until 1837 did the first complete English translation of John Mitchell Kemble (from a family of prominent actors, himself a student of the German linguist, folklorist and political activist Jacob Grimm [of the 'Brothers Grimm']). Innumerable subsequent editions and translations (into many languages) have appeared since. As mentioned earlier, the British Museum MS Cotton Vitellius A.xv is a composite codex, with the Nowell and Southwick codices originating as separate volumes. Kiernan suggests that both of these may themselves be composite codices, but here we are concerned with the Nowell codex (which contains Beowulf) only. This is no place to expound upon the construction of mediaeval manuscripts in detail, but a few basic facts may prove expedient: the codices are composed of sheets of vellum (specially prepared sheep-skin) which are generally folded in half and stitched together into gatherings, which are then themselves stitched together. The gatherings are constructed by placing a number of folded vellum sheets inside one another and stitching them together along the middle-fold (similar to the construction of many modern magazines & journals). Single (non-folded) sheets were sometimes also stitched into these quires (gatherings). As vellum is actually sheep skin, its two sides are not uniform in appearance, with the 'hair' side generally somewhat darker than the 'flesh' side. Unfortunately, the Ashburnham fire destroyed the majority of the original binding, making the determination of the composition of the codex uncertain. Other codicological studies of the Beowulf-ms. arrive at different foliations, see further: Boyle, Clement, Gerritsen (1988, 1989, 1991), Malone. Additionally, there are some questions concerning the dating of the manuscript itself. The late palaeographic expert Neil Ker dates it to ca. 1000, usually interpreted as 975-1025 AD. Kiernan and Dumville both argue that in fact it is actually unlikely to have been written before 1000AD. However, Kiernan--for reasons based on codicology, palaeography, and his thesis that Beowulf itself is nearly contemporaneous with the extant MS.--places the most likely date to post-1016AD, after the ascension of Cnut to the throne of England. Kiernan points out '[a] closely datable example of Square insular script survives in a chirograph of Bishop Byrhteh of Worcester (1033-38) leasing land to his cniht Wulfmær' (Kiernan xvii-xviii), though Greg Rose (136-9) argues that the hand is not the same type of Square minuscule as in the Beo.-ms., or that meant by Dumville. To conclude, the composition of the MS. itself we can probably safely place between 1000-1025 AD; the disagreement of professional palaeographers (as above) makes it difficult to feel confident in assigning a narrower band of dates. One of the key issues of the MS, is the status of fol. 179, which is badly damaged and quite difficult to read, creating several uncertainties in the text. Julius Zupitza, in his facsimile edition of the manuscript, notes that '[a]ll that is distinct in the [facsimile] in fol. 179 has been freshened up by a later hand in the MS'. In the 1960s, Westphalen, on the other hand, identified the 'freshening up' hand as that of the second scribe, but about twenty years later than the original, and the folio itself as a palimpsest. A palimpsest is made, generally, to eradicate an old text in order to provide parchment for a new one. Kiernan, in the early 1980s, proposed that the palimpsest was made by the second scribe himself, in order that he might revise the text. Kiernan attributes the spots of illegibility of the folio to the fact that the vellum was still damp in places when the revision was made, so that the ink did not properly adhere where the parchment was still wet. The more standard position (e.g. Boyle) is that fol. 179 sustained some sort of accidental damage and someone (not the second scribe) attempted to 'touch up' all of the text that he could. '....the person who altered the fitt numbers XXV-XXVIIII did not alter any after that [presumably] because the manuscript unit comprising quires twelve and thirteen was unavailable to him. Likewise [Leonard Boyle (1981)] states that folio 178v, the last page of the eleventh quire, is smudged, as if it had been at one time an outside cover--and it is true, in the facsimiles the script all over 178v looks quite worn in comparison to the preceding pages. Since the last folio of Beowulf of the wear and soiling it received, if folio 179 was the other cover of the unit, doubtless it was also in bad condition. Perhaps it was grimy as well as worn, and that is why the scribe decided to immerse and scour it. Of course he did not have to scour the verso side, but perhaps he simply preferred writing the text anew to tracing over the old letters faded by the immersion--a preference he did not later indulge on the last folio when he saw what a ruin this practice had made of 179. Before he washed away the text he must have preserved it somewhere: either he copied it elsewhere or committed it to memory. I suggest he chose the latter course--a natural course, I think, for a short text in Anglo-Saxon times--one is reminded of King Alfred's famous feat of poetic memorization. This choice explains a great many of the peculiarities of the palimpsest. An experienced scribe would know better than to write on wet vellum, and even an inexperienced scribe would have stopped when he saw the ink begin to run. But a scribe who had committed his irrecoverable exemplar to memory might write on wet vellum, being afraid he would forget the verses before the parchment dried. The same haste would also account for the carelessness that produced the long dittograph. It is now also possible to say why the scribe did not fill in his erasures when he wrote the single thorn [þ] at 179r10--he had in fact forgotten the verses by the time the leaf was dry' (355). Some sort of revision seems to have taken place round folios 179v & 180r -- whether this revision was repairing accidental damage, incomplete correction of a dittograph or other scribal error, or deliberate revision of the text, is more difficult to establish, as the above discussion of various explanations shows. These arguments are also bound up with different theories about the composition and its time period. Kiernan's argument that there is textual revision contemporary with the MS itself is complementary to his thesis of a late dating of the composition of the text of Beowulf itself, as discussed in the following section. We may note that Clark Hall's theory supposes not only Hygelac, but other characters from Beowulf to be historical as well--which has not been proven to be true. He also supposes a 'Geatic' origin (which he supposes to be in West Göteland, in southwest Sweden) of a poem narrating the adventures of a Geatish prince, which picks up its Danish setting on the poet's way through Denmark before he ends up in England--where he is seemingly able to pick up not only English, but the verse-techniques of the Anglo-Saxons--where the poem reaches its final form (more or less). A foreign origin of Beowulf has also been espoused by Thorkelin, who in his 1815 edition claimed that the poem was a translation from Danish. Sarrazin took this a step further, and not only identified the translator as Cynewulf (whose 'runic signature' is embedded in some Old English poem, but not Beowulf), but identified the original (Danish) author as the skald [oral poet] Starkathr, who he placed at the Danish court of King Ingeld at Lejre ca. 700 CE. The famous German metrist Eduard Sievers (1886) refuted the notion of a Danish origin on linguistic grounds. In sum, it is blindingly improbable that Beowulf is either a translation of a non-English poem or the work of a non-English poet. That much, at least, seems clear. '…the obvious conclusion is that the Danish and Geatish exploits of Beowulf were first brought together in the extant MS by the second scribe. The aesthetic fusion of these parts does not reflect a dim, romantic view of a non-Anglo-Saxon past, but rather a vivid imaginative response to chilling contemporary events. The fall of a great and noble hero, and the imminent extinction of the race he ruled, was well understood by this 11th-century Anglo-Saxon who had recently seen the fall of [King] Alfred's house and the subsumption of his homeland in the Danish empire. The second scribe begins to look like "the last survivor of a noble race", while the Beowulf MS, the treasure he continued to polish after the death of his old lord, no longer looks like a reproduction' (12). Kiernan locates the composition of the poem within the reign of King Cnut (r. 1016-35), who accompanied his father, the Danish King Svein Forkbeard, on his invasion of England which forced King Æthelred II (the 'Unready') into exile in Normandy. Cnut became king on the death of his father and married Æthelred's widow, Emma of Normandy, to help legitimise his reign. Cnut's reign was peaceful, especially when compared against the harsh Danish raids which preceded his rule. Kiernan suggests that like Cnut, Beowulf created a synthesis of Anglo-Saxon and Danish culture, though forestalling Whitelock's objections that 'if the poem is later than the time when the Viking invasions began in earnest, about 835, it can hardly be placed before the tenth century, and even then it would have to be put, as Schücking puts it, in the court of an Anglo-Danish king in the Danelaw' (25). Kiernan remarks that 'Cnut brought together Danish and Anglo-Saxon culture in the way no petty king of the Danelaw ever could have done' (22). We shall return to examining the different possibilities for the date of the origin of Beowulf, but it is here expedient to observe the import of assigning a date to the poem, as it affects not only our possible interpretations of the 'meaning' or 'purpose' of the poem, but also our view of the relationship between the extant Beowulf MS and the poem itself. 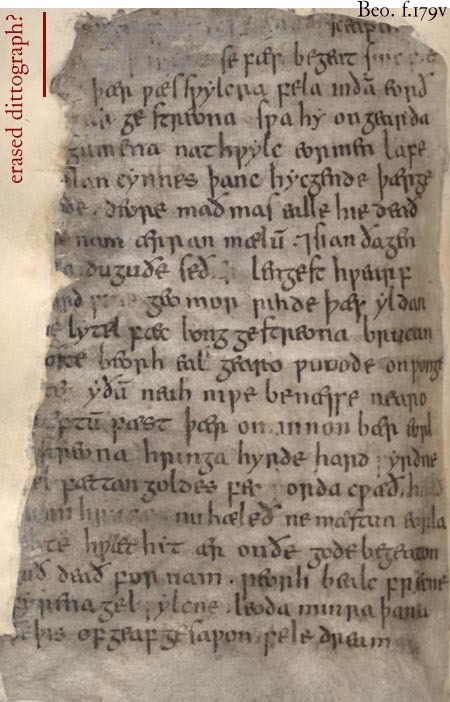 If, for instance, Beowulf was first written down in the 6th century and our extant MS is the result of a long line of copies, made by speakers of different dialects of Old English, then we have much reason for suspecting 'scribal corruption' and thus will suppose more licence to make emendations to the extant text. If, on the other hand, we take the composition of the poem to be contemporary with our extant MS, we will assign more authority to the MS text and feel more wary of emendations. Similarly, both the date and location we posit for the composition will colour our reading of the poem based on what we know of Anglo-Saxon history. For instance, if we assume a post-Danelaw date, we might suspect a political purpose to the poem, i.e. a literary synthesis of English and Danish cultures, which emphasises the commonality between the races. On the Danish elements in Beowulf as clues for dating, see further below, Section c.
Early scholarship of Beowulf tended to favour placing the composition of the poem in late 7th or early 8th century Northumbria, in the time of the Venerable Bede (673-735), most likely in the court of the scholar-king Aldfrith (d. 705), considering that age the height of Anglo-Saxon learning, and cultural pre-eminence of Northumbria in that time. The Northumbrian connexion of Cædmon, often thought of as one of the pioneers of Anglo-Saxon poetic literature has also bolstered that notion. More recently, Schneider suggested, based on the inherent paganism in the poem, as well as the linguistic features, a composition in Mercia between 640-50 in the reign of King Penda. Arguments made for a late date (9th - 11th century) are usually based at least in part on the Danish focus of the poem (e.g. Schücking 1917, Frank 1981, Kiernan 1981, &c.), which does have a possible political motivation in providing a notion of the kinship of the Anglo-Saxons and the Danes, which from the start of the Danish invasions in 835 until the 11th century was a central issue in English politics: the synthesis of the two cultures. Kiernan's argument for an 11th century origin rests largely on his claims for evidence of active participation of the scribes in the production of the poem - the core of which is his analysis of fol. 179 (see section I:MS above). Since the identity of the apparent third hand in this folio is argued variously as being that of the second scribe himself several years after his original writing of the MS or that of an unknown third person the status of fol. 179 is not yet proved decisive in determining the date of the origin of Beowulf's written source. Various scholars have attempted to date the poem by possible allusions to historical persons: Earle suggests that the seemingly incongruous lines about Offa I, the legendary late 4th century King of the Old Angles, as an allusion to the 8th century King Offa of Mercia, taking the supposed name 'Thryth' (l. 1934b) to be a form of Cynethryth - the name of Offa II of Mercia's queen (see n. to l. 1934 for a counterargument on this latter point); Cook, again placing the poem in 7th century Northumbria, sees King Aldfrith concealed beneath the name Offa; Brandl, because of the character Wiglaf, dates the poem to the reign of Wiglaf of Mercia (r. 827-38)--seeing in the character of the evil king Heremod a representation of the 'pagan' king Penda of Mercia (r. ca. 632-55); Kiernan (xxi) to early 11th-century Lincoln (in part because of the possible connexions between the Beo.-ms. & the Blickling Homilies ms. [see above]). I favour, with Bruce-Mitford & Sam Newton, a location somewhere in East Anglia. In sum, the historical allusions in the poem, with the exception of that of Hygelac, seem largely insufficient as a basis for any sound dating of the text. Turning to the linguistic and metrical evidence puts us on somewhat firmer ground. The language of the poem is predominantly (late) West Saxon, with a significant amount of Northumbrian and Mercian characteristics and forms, with some signs of Kentish influence as well--fairly well covering the entire Anglo-Saxon dialectic map. The overwhelming late West Saxon nature of the language could, in theory, indicate an equally late date for the composition of the poem itself, as Kiernan suggests. However, we know that scribes tend to adjust forms from older exemplars in accordance with their own dialects, so it is unsurprising to find that an 11th century MS is written in predominantly late West Saxon. 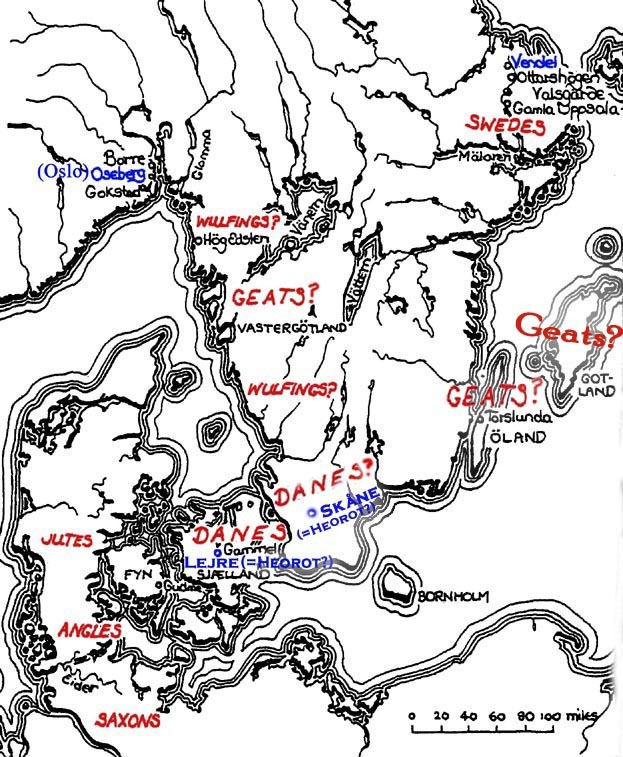 Nor does the use of the West Saxon dialect provide any clear indicator of place of composition, as West Saxon became the predominant literary dialect in the late Saxon era. Scholars have generally assumed that the poem was originally composed in an Anglian (Northumbrian or Mercian) dialect. Kenneth Sisam (1953:119-39) has questioned the evidence usually cited in support of an Anglian origin, pointing out that so-called Anglianisms like waldend (for late West-Saxon wealdend 'ruler') are simply features of the poetic koine in which almost all Old Englsh poetry is preserved, though the origin of such forms is ultimately Anglian. Fulk's important work (1992), however, shows that there is a large number of Anglian morphological characteristics, which are mainly absent from poetry known to origin in the south, which is found in poems usually thought to be Anglian--and in Beowulf. Important features include: the use of sægon for Southern sawon ('saw'); cwóm(on) for Southern cóm(on) (the preterite of cuman 'to come'); in- as a verbal prefix in place of Southern on-, in its inceptive uses such as inhaétan ('inflame'); the preposition mid ('with') may use the accusative case, whereas it is only found with the dative and instrumental cases in Southern texts; and many others (see Fulk 1992:309-25). Whatever the date of the poem, the language favours an Anglian provenance, and the evidence slightly favours an origin in the Midlands--in Mercia or East Anglia (see Sam Newton 1993 on the latter)--than Northumbria, despite an early academic preference for a Northumbrian origin. Important linguistic clues to the dating of the poem include the apparent lack of any Scandinavian loan words (as noted by Frederick Klaeber (cxvii)), which are found, for instance, in The Battle of Brunanburh, which has cnearr for 'ship', derived from Old Norse *knarru, or The Battle of Maldon which contains the probably Scandinavian loans dreng 'warrior', grið 'truce' - the lack of such items is particularly suggestive in poem so intimately concerned with Scandinavia and suggests a pre-Viking date (<835). A related cue is the form of proper names in Beowulf : the character Hrothgar, who appears in Nordic sources as well, is named there as Hroárr or Roe;likewise the character Hroþulf appears in the Nordic as Hrolf and other forms showing syncope of the medial consonant. Fulk (1982) points out that 'we have evidence of extensive changes [in the forms of the names] long before the Vikings' arrival in England, e.g., the name rhóltR on the Vatn stone (Norway, ca. 700). This derives from *HróþuwaldaR, giving OE Hroðweald (hroðuald, early ninth century, Liber Vitae Dunelmensis), which in turn suggests *HróþuwulfaR should already have been nearly identical with ON Hrólfr by the time the Beowulf poet used the name Hroþulf. And so the proper names in the poem must be exactly what they appear to be--authentic inheritances from a much earlier time'. As Fulk goes on to point out this proves neither earliness nor lateness. However it does appear to establish the authentic Englishness of the name-forms in the poem--i.e. 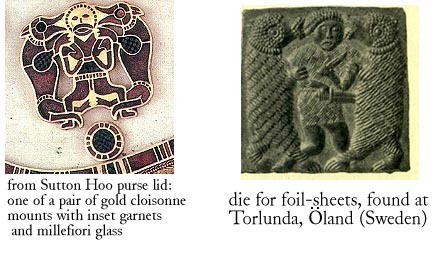 the appearance of these names in the poem does not seem to require Viking-age transmission. Fulk's 1992 book, A History of Old English Meter, examining both linguistic and metrical aspects of Beowulf, provides some very important and solid data and arguments for determining the most likely date of composition. 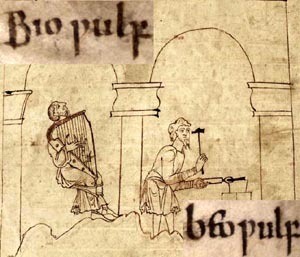 Fulk outlines several possible means of establishing a terminus a quo [earliest possible date of composition] for Beowulf and other longer OE poems. One of these is loss of intervocalic h, which appears sporadically in the early Latin-OE glossaries (Fulk 368-74). The glossaries also show occasional lack of smoothing (smoothing is an Anglian phenomenon in which diphthongs ( ea, eo, io) were monophongised to æ, e, i, respectively, before the back consonants (c [k], g [g], h[x])), though this is more likely to reflect dialectal and scribal variation than chronological variation (Fulk 374-6). Another possible terminus a quo cue is the apocope of -i,-u (in final unaccented syllables after a long accented syllable, or a short accented syllable and another syllable -- see Campbell 144-7), which seems a promising possibility, since, as Fulk says, 'none of the longer poems contain verses that will not scan correctly without the final vowel, though all contain examples of verses that would be spoilt metrically by the addition of the vowel' (378). Fulk (378-81) is sceptical of the reliably of the vowel apocope for dating, and Amos (18-29) even more so. However, Fulk concludes, based largely on the apparent chronographic alternations of intervocalic h, that '[n]oncontraction [of intervocalic h] is clear frequently enough in the early glossaries that a measurable difference can be observed between the glossaries and the verse of Cynewulf in this regard. In earlier verse the distinction is less pronounced. Thus, Beowulf... [is] unlikely to have been composed much before ca. 685, though [it] may be considerably later than that' (381). For even if one assumes an early written form of Beowulf, its survival and transmission--if such rabid anti-Danish sentiment existed after, say, 825AD--would be rather unexpected. However, those these facts concerning the later refashioning of Anglo-Saxon royal genealogies and the appearance of 'Scylding' and 'þeodcyning' in Beowulf may be suggestive, they do not necessitate that the usages in Beowulf are guided by (late) Danish and Anglo-Danish employment of the same or similar terms. Old English Þeodcyning and its Norse cognate may have developed a meaning similar to that of 'emperor', without this necessarily being the earlier sense of the compound. Likewise, a meaning akin to 'emperor' could have existed earlier, whether or not it reflected the existing political situation of Anglo-Saxon England (or Denmark). Concepts can exist without immediate material correlates, and a concept of 'emperor' may still have been useful to early Germanics in their relations with Rome. Similarly, the late appearance of 'Scylding' outside of Beowulf still does not eliminate the possibility of an early usage of the title, though it may have been more geographically restricted in pre-Viking age England. Not only does the East Anglian pedigree contain Hroðmund, but based on Bede's records, the founder of the East Anglian royal line was Wuffa, 'a quo reges Orientalium Anglorum Uuffingas appellant' ("from whom the kings of East Anglia are called Wuffings"). Further, as Newton argues, 'the name Wuffa appears to be a diminutive variant of Wulf, and can thus be translated as 'Little Wolf'. The patronymic form Wuffingas seems similarly best explained as a variant of Wulfingas, "the kin of the wolf", a folk-name which is mentioned in both Beowulf and Widsith' (Newton 105-6; see also O'Loughlin 4). In the Scandinavian tradition, Hrethric is killed, but his brother Hrothmund has no Norse counterpart figure. Newton suggests that in an English tradition, Hrothmund survived, but in exile: '...on the one hand, we have Hroðmund the Scylding prince, fate unknown, though perhaps in exile; and on the other, we have Hroðmund the East Anglian [early] dynastic ancestor, perhaps associated with a royal origin-myth' (Newton, pg.104). Thus we find some facts pointing towards an East Anglian royal interest in some of the actors of Beowulf. Thus, there are strong arguments for associating the creation of Beowulf with East Anglia, even aside from the general evidence of its early Scandinavia elements. 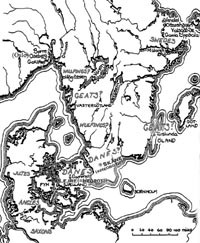 Though there are also many aspects of the later Viking-Age Danelaw, as well as of the still later Northern Empire of Cnut, which are also possible sources or reasons for the centrality of Scandinavia in Beowulf. Even if these latter ages played little role in the initial creation of Beowulf (which is by no means a foregone conclusion in any case), they certainly suggest reasons why Beowulf may have remained relevant (and popular?) for at least some Anglo-Saxons (and Anglo-Danes), at least until the beginning of the eleventh century. The last 150 years or so have seen a variety of views on the structural and thematic unity of Beowulf. Many of the early (esp. German) critics analysed within Liedertheorie, considering the poem to be made up of a variety of originally separate pagan Germanic lays or ballads, loosely woven together by Christian scribes. Karl Müllenhoff's well-known 'Die innere Geschichte des Beovulfs' is perhaps the most comprehensive analysis of the poem in the Liedertheorie 'dissectionist' tradition, suggesting that Beowulf's Danish adventure against Grendel and the fight with the dragon were originally two separate lays pieced together later--the first section dealing with Denmark having already augmented separately with a 'second episode' featuring Grendel's dam and a third episode concerning his return to Geatland (so-called 'Beowulf's Homecoming'). From the early 20th century, most critics have argued strongly against this sort of 'dissectionist' view of Beowulf, stressing its thematic and stylistic unity: e.g. Klaeber (1911-2 & ed. ), Chambers, Tolkien, Chance (Nitzsche), & many others. Although the divisions made by Müllenhoff do indeed correspond to natural breaks in the plot of the poem, I am in agreement that we find an essential unity in Beowulf, which tells against the Liedertheorie, or, at least, a simplistic version of it. However, this does not exhaust the possibility of something resembling composite authorship. Within the oral-formulaic theoretic framework (as developed by Parry, Lord, et al. ), some critics, notably Francis P. Magoun, ressurected the idea of something like a composite poem, and thus some began think again about the possible pre-history of our poem, to though not in the same way as in the older Liedertheorie, as it does not necessitate a heaping up of unrelated 'lays' or 'ballads', but can conceive of composite authorship within the framework of skilled verbal-artistics located within, and manipulating, a structured communal tradition. Oral-formulaic theory is discussed in more depth below at section e..
(3)King Beowulf's fight against the dragon (lines: 2223-3184). Additionally, in terms of plot sequence, a large break occurs inbetween parts (2) and (3): parts (1) & (2) concern Beowulf's youthful adventures in Denmark, and his triumphant return to Geatland; part (3) rapidly skips 50 years or so forward, Beowulf appearing as a greatly aged King of the Geats. Numerous commentators have noted the subtle change in tone between the sections telling of young Beowulf, and that recounting Beowulf's final days on earth (of course, that we should observe a change in tone, and some thematic development between these two parts is not unexpected). Interesting discussions of these alterations in tone include: Tolkien, Osborne, and Irving (1984), amongst many others. Both Schücking and Magoun (1958, 1963) have pointed out a number of minor plot inconsistencies between the action of part (1) and the account given by Beowulf to Hygelac in part (2), including: Hrothgar's sons are mentioned prominently in part (1), but in part (2) they are not mentioned, and Beowulf discusses only the impending marriage of Hrothgar's daughter Freawaru (not mentioned in part (1)); in part (2) we learn that Grendel apparently had some sort of 'bag' (glof) to stuff his victims into, but this is not mentioned at all in part (1), nor is the name of his Geatish victim, Hondscio. Other possible discrepancies exist, for which see Schücking (esp. 12-13), Magoun (1958, 1963); for convincing counter-explanations of many of these as deliberate artistic variations, see esp. Brodeur (1970). Schücking (53-4) also mentions a number of other features which are characteristic of part (2), though not as distinguishing as those above. Kiernan also argues that there is evidence from variation in spellings used through the Nowell codex that the two scribes tended to faithfully reproduce at least some features of their exemplar texts, and, further, that there are suggestive spelling differences between what are roughly parts (1) & (3) which would suggest that Beowulf was copied from two different exemplar texts, rather than a single text: '...though the spellings in the prose codex and in the Judith fragment are not appreciably different from the spellings in Beowulf, there are enough minor differences to suggest that both scribes faithfully copied the spellings of their exemplars. Hence a possible explanation for the orthographical differences between the first and second scribe in Beowulf is that their respective parts of the MS are based on two different exemplars' (pg.275). Kiernan (see esp. 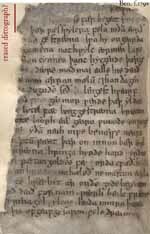 219-78) also argues that the MS here too 'provides compelling codicological evidence that [the second scribe] copied a new episode, designed to fuse Beowulf's Danish and Geatish exploits into a unified epic' (pg. 262). The codicological evidence is Kiernan's analysis of f.179 as a palimpsest (see above, section I.d. ), and thus the reason, on this theory, for the creation of the palimpsest is that: '[a]pparently, many years later, [the scribe] was still working toward a better fusion of the parts, on the revised text of fol. 179' (ibid.). This idea, unsurprisingly, remains controversial, and is not widely accepted. But it is attractive for reasons, such as those cited above: the subtle, but suggestive differences in phrasing and syntactic usage in part (2), 'Beowulf's Homecoming', some apparent minor plot inconsistencies, and a shift in tone between the Danish and Geatish sections (parts 1 & 3, respectively). However, this idea is at odds with the evidence for great antiquity provided by an examining of the conformity of Beowulf's verses to Kaluza's law. Of course, as I note in my article on Kaluza's law, there remains some uncertainty about the exact interpretation one should give for Beowulf's strict adherence to the law. Milman Parry's fieldwork in Yugoslavia in the early-mid 20th-century discovered a living tradition of illiterate singers (both Muslim & Christian) of traditional folk-poetry. Parry argued that this tradition of the Serbo-Croatian oral-formulaic guslar singers is part of a larger Indo-European tradition of oral-formulaic poets, initially with the argument that the Greek Iliad and Odyssey were created in a manner not dissimilar to the method he observed in the songs of the Serbs and Croatian oral poets. It was soon recognised that the repeated phrases which occur in Germanic traditional poetry were evidence of a similar tradition amongst Germanic scopas and skalds. This somewhat restrictive picture of juggling of formulae has been expanded somewhat in later work following in the oral-formulaic theory. In particular, that of course not each verse must be or is a learned formula, obviously poets can and must invent new formulae; and, further, that Old English formulae are quite malleable. The use, invention and adaptation of formulae in Old English verse reveals a deliberate and complex artistry. And the idea of the requirement of a formal 'apprenticeship' seems incorrect as well (though in some cases, especially in the case of professional bards, there may be something like an apprenticeship), as these formulaic techniques of construction are not restricted to verse, as we find them pervasively in OE prose as well, such as the sermons of Archbishop Wulfstan of York (see Orchard 1997:109f.). So, to a certain extent, OE speakers and writers seem to have 'passively' acquired some of their formulaic diction, simply by virtue of being part of an oral-formulaic culture. In fact, formulaic diction is not limited to English of over a millenium ago, nor to Serbocroatian, but in fact can be observed to still be pervasive in structure of speech of many public speakers and others. For instance, Orchard (1997:111-4) notes similar technique and use of repeated formulae not only in the OE homilies of Wulfstan, but also in the that of speeches of the American civil reformer Dr. Martin Luther King, Jr. (e.g., 'Free at last! Free at last! Thank God Almighty, we are free at last!'). Likewise, Alta Cools Halama notes similarities between the structure and use of common and/or repeated lyrics in a variety of modern "gansta' rap" music, and in particular contexts in Old English narrative poetry, most particularly in the flyting contest of words between Beowulf and Unferth. 'Homer is most dependent on the repeated phrase just where oral theory would predict...[while the Anglo-Saxon] scop shows unmistakably his ability to express a given idea in as many ways as he likes' (Russom 1978:207). '[Homer's] adherence to a single verse-making strategy can be observed most clearly in his whole-line formulas and systems....[he] says of the Cretans [in the Iliad] in 650 that "spear-famed Idomeneus led them" (των μεν αρ' 'Iδομενευς δονρικλυτος `ηγεμονενε). Seven lines later, the leader of the Rhodians appears in an identical type of line (των μεν Tληπολεμος δονρικλυτος `ηγεμονενεν). The two formula frames differ only with respect to 'αρα, a meaningless verse-filler necessary for the first name, but not the second....such details testify to a concern with overall structure and at the same time to a complete lack of interest in elegant variation' (Russom 208). '...in Anglo-Saxon verse the number of light syllables is not strictly regulated [as is the Greek verse--BMS], a poet can change unstressed function words and pronouns with great facility. A given formulaic pattern can therefore be adapted to a much wider variety of uses than can Homeric formulas. Fully stressed words can also be exchanged where their position makes alliteration unnecessary..' (Russom 209). So one should not understand the oral-formulaic construction of poetry to be confining in a limiting sense, for skilled poets can manipulate it in many ways, but rather as forming the medium within which Old English verse is cast (as well as that of other traditional oral poetry in certain other languages/cultures). One of the important aspects of oral-formulaic theory is that it necessitates a shift in our thinking about the 'author'. Within oral-formulaic poetry, we find a heavy reliance on tradition, both in the metrical structure and use of common formulae, as well as in the choice of subject-matter and story (see also part c. above). Likewise, in oral traditions, poets usually and frequently re-use material from other poems or songs, freely borrowing and adapting material from other poets. So, at least in theory, Beowulf may not have been composed all at one go. Certainly, even if it did originate with a single author, this author relied on and worked within a very traditional cultural framework of vernacular poetry. It could even be the case that Beowulf was continually reworked by a number of different poets, and further that different versions and episodes ('sequels'?) of the poem may have arisen. It should be noted, however, that there is little direct evidence for these sorts of possible pre-histories of Beowulf, other than the common occurrence of this phenomenom within oral/oral-formulaic 'texts' in general. Kiernan's theory that folio 179 is evidence for revision (by the second scribe) of the transition between two originally separate tales about Beowulf (or a Beowulfian hero) should be considered with the structures and traditions of oral-formulaic verse in mind (though Beowulf may be a 'conjoined' poem in this sense whether or not folio 179 is the result of later editorial revision). Orality continues to affect even the written transmission of poems as well. Most OE poems are extant only in a single MS, but we do have limited evidence from a handful of poems which exist in more than one copy. The poems known as Cædmon's Hymn and Bede's Death Song are two notably instances of poems recorded in a number of mss. appearing over a sizeable span of time. For our purposes, two interesting observations can be made from OE poems appearing in multiple copies: (1) we find evidence for high levels of scribal accuracy over long periods of time; and, (2), that when we do find variation, it is often variation of formulas (as Kiernan (174-5) says: '..aside from dialectal transliteration, the only significant differences between the 10th-century West Saxon MS (Tanner 10) [of Cædmon's Hymn], and the early 8th-century Northumbrian MS (Kk. v. 16), known as the "Moore MS", is the aelda versus eorðdan variant'). Though this is not to say that we do not also sometimes observe significant scribal corruption in these and other poems. But in the cases of 'formulaic' variation, what we see is that a scribe will substitute a semantically equivalent, or near-equivalent, word or formula: '...a scribe [may] consciously or unconsciously "improv[e]" a received text from his own knowledge of the formulaic tradition...which has been described as the result of what is termed [by O'Keeffe] as "residual orality"' (Orchard 1997:117). The variation in Caedmon's Hymn of aeldu barnum (biblical 'sons of men') for eorðan bearnum ('sons of the earth'), or vice-versa, is conceivably an example of this sort of formulaic-revision; as too is the variation between the highly formulaic compound eorðbugendum ('earth-dwellers') for iegbuendum ('island-dwellers') at l.3a in Alfred's Metrical Preface to Gregory's Pastoral Care (see again Orchard 1997; and see esp. O'Keeffe, O'Donnell for further examples and discussion of the transmission/evolution of these and other OE poems). In Beowulf, a plausible instance of formulaic-substitution occurs at l.964, þæt he for handgripe minum scolde ('..that he because of the hand-grip of mine must...'). Usually modern editors emend handgripe to the semantically-equivalent mundgripe (which occurs elsewhere in Beo. at ll. 380, 752, 1536, 1941), to provide standard linking-alliteration with minum ('(of) my'). The most straight-forward explanation for the appearance of handgripe here is the inadvertant substitution by a scribe (not necessarily the first scribe of our MS., though this is quite possible as well) of a formulaically-equivalent compound for mundgripe. These sorts of occurences of formulaic substitutes (which may be somewhat frequent in Beo., though largely undetectable except when they 'violate' the normal alliteration or metre) raise the question of the value of Kaluza's law (see section b. above) for purposes of dating Beowulf. However, even a cursory glance at the verses to which Kaluza's law applies (at least to what I call, following Fulk, types I & II) shows that most instances involve double-alliteration in the -verse, e.g. l.76: folcstede frætwan. him on fyrste gelomp (Kaluza's law applies to underlined a-verse). In most such verses double-alliteration is compulsory (in Bliss-type 2A3a verses (Sievers-type A2l) with secondary stress in the a-verse, see Bliss §53; Bliss-type D3 (Siever-type D2) also require double alliteration, see Bliss §52), and therefore formulaic substitution (which would have great potential to cause violations of Kaluza's law), intentional or inadvertent, would be generally blocked by the difficulty in substituting a semantic/formulaic equivalent without disturbing the compulsory double-alliteration. Furthermore, these types of verses not only are found violating Kaluza's law in late poems when they occur, but they become increasingly infrequent (regardless of conformity to K's law) in late poetry. Therefore, not only are these types of verses more likely to be preserved undisturbed in the transmission process due to the general inavailability of ready formulaic substitutes, but later poets (and 'editing' scribes) who may 'revise' a poem in various ways, are also less likely to add in verses which would violate Kaluza's law, since specific verse structures to which it applies become very infrequent on the whole in later OE verse. The upshot of this is that Beowulf could constitute a relatively early poem (8th-century), or poems--as the evidence of Kaluza's law would seem to require, and yet have be revised in certain (limited) ways at a later point, along the lines suggested by Kiernan. This sort of revision would presumably not include major addition or alteration, but could include minor adjustments, and certainly the joining of two poems with a revised transitional textual bridge. This sort of analysis may be one way to reconcile conflicting claims of 'early' and 'late' datings of Beowulf, though it must remain rather speculative at this point. 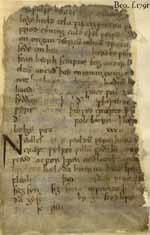 Whatever may be the exact timeline of its construction may be, we may feel confident, and fortunate, that our sole extant version of Beowulf as found in British Library MS Cotton Vitellius A. xv is a complete and relatively reliable text of matters concerning a character known to us as 'Beowulf'. It is certainly one of the finest of Old English poems, and in my opinion one of the most splendid works of literary art, in the class of the Iliad, Mahabharata, or Shakespeare. "Wella, wisan men, wel; gað ealle on þone weg ðe eow lærað þa foremæran bisna þara godena gumena & þara weorðgeornena wera þe ær eow wæron. Eala, eargan & idelgeornan; hwy ge swa unnytte sien & swa aswundne? Hwy ge nyllen ascian æfter þæm wisum monnum & æfter þæm weorðgeornum, hwylce hi wæron þa þe ær eow wæron? & hwy ge þonne nyllen, siððan ge hiora þeawas geascod hæbban, him onhirian, swa ge swiðost mægen? forðæm hi wunnon æfter weorðscipe on þisse worulde, & tiolodon goodes hlisan mid goodum weorcum, & worhton goode bisne þæm þe æfter him wæron. Forðæm hi wuniað nu ofer ðæm tunglum on ecre eadignesse for hiora godum weorcum." "Ah, you wise men! you all walk in the paths which were shown to you by the famous patterns of those good men and those who were eager for honour--who came before you. Alas! you wretches and lovers of idleness; why are you so useless and so inactive? Why won't you ask about those wise men and about those who were eager for honour, to find out what sort of men they were, who came before you? And why, having found out their qualities, won't you emulate them, as much as you can? For they strove for honour in this world, and obtained great glory by their good actions, and made a good example for those who came after them--thus, they now dwell above the stars in eternal happiness, because of their good deeds." otherwise no part of these documents may be reproduced without expressed permission from the author.